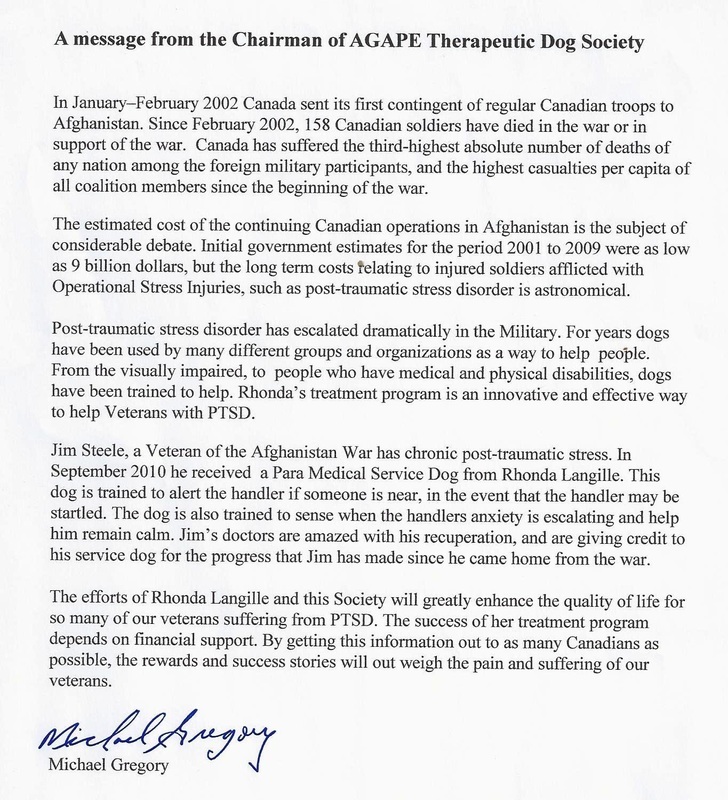 It is my pleasure to recommend Rhonda Langille for the Animal Assisted Service Dog program for Canadian Veterans as well as any citizen who suffers from the many forms of mental illness, including PTSD or physical injuries that leave one with mobility challenges. Rhonda is a warm and vivacious person who has demonstrated excellence in working with people, dogs, and animals in general, for over the 20 years that I have known her. Rhonda has a strong belief in the value of animals helping humans to connect or reconnect. She has been working for years developing and promoting the importance of using animal therapy in helping people rebuild their lives. Being a professional dog trainer and canine behaviorist gives her a unique understanding of how a dogs mind works, enabling Rhonda to train dogs for individuals that have been declined from other organizations as their disabilities were too high of a challenge to be teamed with a Service Dog. In our conversations, as well as from personal experience we both understand that dogs love unconditionally. By establishing a bond of trust with the dogs, individuals will be able to develop confidence and respect for self and others in their lives. The responsibility of caring for the dogs including daily grooming, feeding, exercising and health maintenance encourages clients to see the importance of these valuable jobs in their own daily routines, as well as the gentle nudges that Rhonda gives her clients encourages one to become stronger in their abilities as she coach her clients to move forward in working as a team with their four legged partner. The society is starting a program to ensure that anyone who is facing financial challenges will have the funds to care for the service dog for the short term or the life of the dog if required. We understand how difficult life can be at times, for that reason we promote embracing the “whole” to ensure that each individual has the tools to grow and enjoy life’s precious moments without the stress of worrying about being able to buy dog food. It brings me great pleasure to be part of this remarkable team of Agape’ Therapeutic Service Dog Society. Giving the gifts of confidence and self believe as well as independence to an individual is superlative to watch. A Stevie Wonder quote, We all have the ability; the difference is how we use it. We will be adding more information and photos shortly!